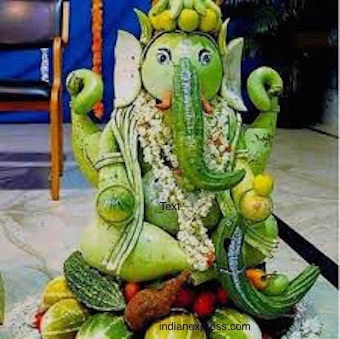 Is it just me or was there a definite shift towards a more green Ganesh Chaturthi this year? From idols made with organic clay and naturals colours( good for the fish and the sea) to chocolate Ganeshas designed to be immersed in milk to make milk chocolate for the poor kids, people were embracing all kinds of new ideas, including recycling and re-using the same idol every year. It’s a heartening trend and I hope it continues. At the core of Hinduism there has always been an inherent connection between man and nature, the religion after all sprung from nature worship. But somewhere along the way we seem to have lost that connection. Hindu deities and their iconography are incomplete without the natural elements associated with them. Ganesha, the elephant headed god, rides a mouse, Hanuman is the powerful monkey god, Shiva rides a bull, has snakes coiled round his neck while the River Ganga flows from his locks. Saraswati rides a swan while the fierce Durga, a tiger. All of them are very sacred to Hindus. Yet, so often we end up destroying the very things we consider sacred. The rivers and lakes are clogged with rotting flowers and leaves, the remnants of a puja which a Hindu would be loathe to throw away as garbage. The fact that they end up as garbage and pollutes their sacred rivers is hardly considered by any. 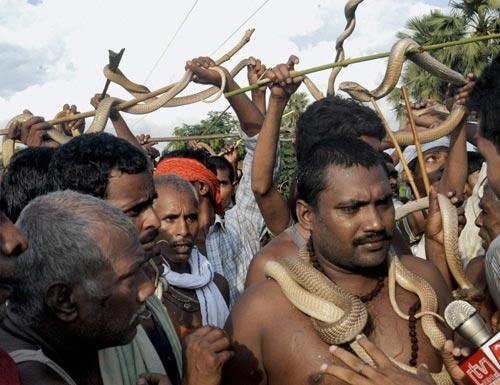 On the day of Nag Panchami, when serpents are worshipped thousands of snakes go through the torture of having their fangs pulled out just so that the snake charmers can parade them around for people to worship them in exchange for a small fee. Most of the snakes end up dying because they are force fed milk which according to myth is their favourite food. Which of course it isn’t but no one is listening. My mother tells me how my grandmother would observe the kokila vrat. A fast where in you don’t eat unless you catch sight of the elusive cuckoo bird. My grandmother often walked for miles until she heard the song and found a cuckoo. She would then walk back home to break her fast. To me the day has a wonderful significance. I see it as a day to pause and see if everything is all right in the natural world. Are the birds, literally, still singing ? If they are not then something is amiss. However today in the manic everyday rush who has the time to walk into the woods looking for birds? Instead you walk down your street to see if there are any lined up in cages by hunters who catch them for you! On the occasion of Makar Sankranti, the practice of flying kites is really popular. Kite flying competitions take places on crowded roof tops, of congested towns and cities and poor unsuspecting birds get caught in the cross fire ending up dead or worse mutilated. Thousands of cows and buffaloes are slaughtered en masse during the Gadhimai festival in Nepal as an offering of thanks to the Goddess. A practice that started 400 years ago is still followed blindly. Shocking to think these are the very same cows that are considered so sacred at other times. I could go on and on but the point is this…. it’s time we addressed this disconnect between ideology and practice. We must understand the true significance of the festivals we celebrate and then change or abandon the rituals and customs that destroy the very things we revere and love. The good news is the awareness is growing, not just among naturalists and conservationists but among ordinary people like you and me. And I take heart in the fact that Hinduism is not rigid in its ways. It has always adapted and changed with the times. We may yet see it reclaim the old, real connection we once had with nature. Super like… Completely agree . I like this article too much. I too agree with you. According to our mythology books worship about kokila vrat is not exactly as you wrote. We can break our fast by praying 9 times mantra given in mythology book not necessary to see the cuckoo bird and here voice and then break the fast. Finally worship in nature is worship in God. I always read your article and i always gets some new idea and detailed knowledge about our God. Your latest article is too good but About Kokila Vrat i think something is missing. I read the post given by Mrs Vaishali M Taywade I too agree with her about Kokila Vrat details given by Mrs Vaishali Taywade. Yes, I did not go into the mythology of any of the examples. There is one myth which speaks of Sati being cursed to turn into a cuckoo. But I think if we look beyond any myth the real meaning of a festival or a tale lies in something more simple and real.